Food insecurity is when families have run out of food and have not been able to afford to buy food during the past 12 months. Mild and moderate food insecurity has been linked to poor nutrition and higher rates of obesity. 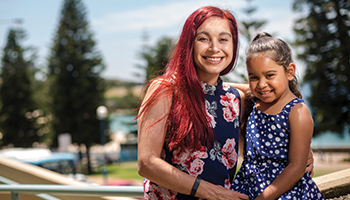 It is experienced by one in five urban Aboriginal households, compared to just under 4% of the general population, according to the Australian Bureau of Statistics. The study team spoke to Aboriginal families, Elders, Aboriginal health workers, council, charities, food suppliers and local government in both the regional town of Wagga Wagga, NSW and in Campbelltown in western Sydney, to identify the many interconnected reasons that contribute to families’ inability to ensure a stable supply of fresh, healthy food. The community nominated a number of measures to improve food security in their communities, including a pop-up grocer to sell healthy food at a reasonable price and a shuttle bus service to take people to the supermarket; providing support with education around budgeting and meal planning; and providing subsidised healthy food boxes. The project is working towards developing a food security framework for urban Aboriginal communities, ahead of embarking on a community-led plan to address the problem in 2020. Project lead Dr Sumithra Muthayya said physical activity and healthy eating programs alone would not fix the problem of food insecurity in urban Aboriginal communities. “We can’t address food insecurity without fixing the system – things like whether people can afford to buy good food or have a car to fetch it. In this project, we wanted to talk to families and find out for ourselves what it is they are facing from the people experiencing it,” she said. The research revealed that many Aboriginal families are trapped in a vicious cycle of financial disadvantage, relying on pay day loans to purchase food as families depended a lot on welfare payments that were simply not enough to go around. Unlike Elders, they often don’t have the skills to manage finances, budget, or cook cheap, healthy meals to ensure a continuous supply. Many were providing food for extended family and other community members, sometimes for lengthy periods of time, or the food budget was being used on competing interests such as cigarettes, alcohol or drugs. Another problem was a lack of accessible fresh food. Supermarkets in local suburbs did not stock healthy choices or those choices were more expensive, and some families were unable to easily travel to large supermarkets by public transport. As a result, households were likely to rely on cheap food such as large meat packs to feed the family, or cheap fast food, which was heavily advertised and readily available. The research is embedded in the Study of Environment on Aboriginal Resilience and Child Health (SEARCH), which is a partnership between the Sax Institute, Aboriginal Health and Medical Research Council (AH&MRC), leading researchers and Aboriginal Community Controlled Health Services (ACCHSs).